A staple bait for Z-Man pros Stephen Browning and Luke Clausen, the Mag FattyZ is a scaled up version of the popular 5" FattyZ that is ideal for a variety of bassin' applications nationwide. 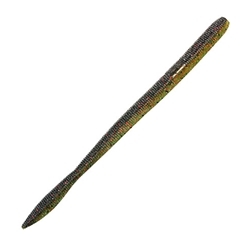 Its thick, solid body can easily hide the point and barb of a 5/0 flipping hook, and the tail necks down thin before transitioning into a bulbous tail that swings on the shake, triggering strikes. This extremely versatile addition to the ElaZtech worm lineup can be rigged on a magnum shaky head, dragged along the bottom on a Texas or Carolina rig, or pitched around cover and is a go-to bait for our pros when a big bite is needed!